The months of April and May are traditionally the time when “spring roundups” take place. This is the time that large and small cow/calf operations schedule the “working” of the calves. As the majority of the calves reach their second month of life, it is time to castrate the male calves (if this has not already been done) and immunize all of the calves to protect them against blackleg. In some situations, calves may be vaccinated for the respiratory diseases, i.e. IBR and BVD. Check with your large animal veterinarian about these immunizations. Give injections according to label instructions. Subcutaneous (SQ) means under the skin, intramuscular (IM) means in the muscle. Some vaccines (according to the label instructions) allow the choice between intramuscular (IM) and subcutaneous (SQ). Always use subcutaneous (SQ) as the method of administration when permitted by the product’s label. Remember to “tent” the skin for SQ injections, unless instructed otherwise by the manufacturer. 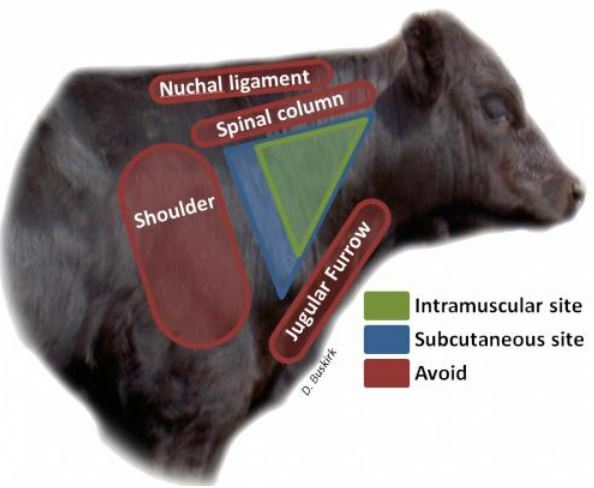 Proper injection technique is just one of many components of the Beef Quality Assurance effort that has had a positive impact on the entire United States beef industry.